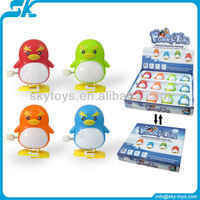 Wind up penguin cartoon gift toys penguin toy animal Clockwork spring toy . China.We have spacious standardized workshops with advanced equipment for scientific research, production, testing, and design, we also have mould center, assembling center, modern office and dormitories.Etc. Our business has grown steadily with the backup of good service and on time shipment to our global customers and distributors.We also offer the market unique products which easy to demonstrate and good to sell. 1> we are manufacturer with own factories and R&D Dept. Good technology support will be very helpful in our cooperation. 3> we know your market. We have a stable and professional service team with more than 10 years of experience, exported to Europe, America, Middle East, and Pan-Asia. Etc. 4> we support you with good service, payment terms, lead time and logistics control. 5> we are seeking global distributors. Please come to us to know more. 1> Drop shipping and mixed orders are accepted. 2> Small orders and sample orders are also welcomed. 3> MOQ: If we have the items in stock, we will not request it. 4> A trial order or sample orders are welcomed. 1> usually we send our goods via EMS. Should you want to ship them by the way you want, please feel free to contact us. 2> we will send the products in 7-14 days after the bank confirm receipt. 3> an express number will be sent to you via e-mail for your reference. We are committing ourselves to make the best toys in the world !